Today is National Taco Day! These plantain tortillas are my all time favorite. 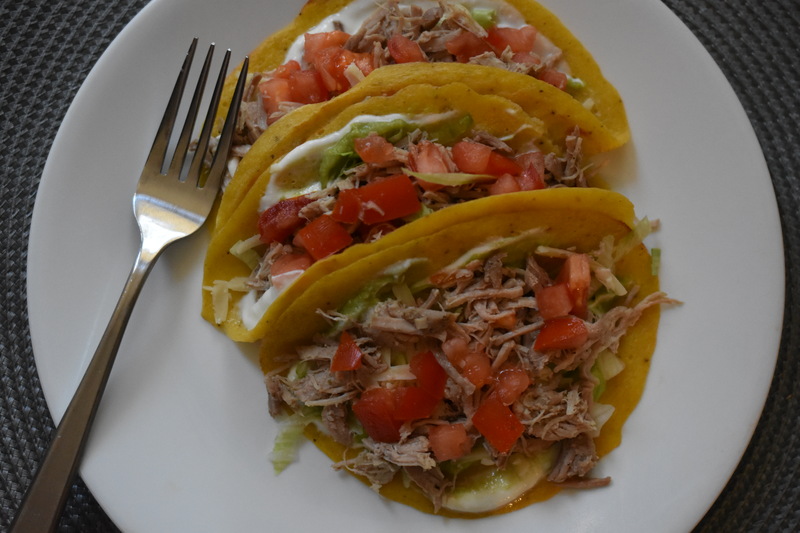 Top those with some taco toppings and shredded pork, and you are in taco heaven. I made the shredded pork in an instant pot (electric pressure cooker). By using the pressure cooker method the pork only takes 30 minutes. You could use a crock pot and put it on in the morning, so when you come home from work all you have to do is the shredding. Cut up pork brisket into large chunks. This will help the meat to cook faster. In a large skillet melt bacon fat. Add meat; sprinkle all-purpose seasoning generously over meat. Brown meat. Transfer to pressure cooker. Add chicken broth, and cook according to pressure cooker (instant pot) instructions. Mine said to cook for 30 minutes, and it turned out perfect. This would be the time to put the meat into your crockpot, if that is what you have chose to use to cook your pork brisket. When the pork is done, remove from cooking source and place on a cutting board to shred. I used two forks for the shredding process. Spoon some of your cooking broth over the shredded pork to keep it moist. Assemble tacos. Serve. Eat. Enjoy. Next post: How Do You Cut Up A Whole Chicken?